Catherine Gregory | The Chamber Music Society of Lincoln Center. 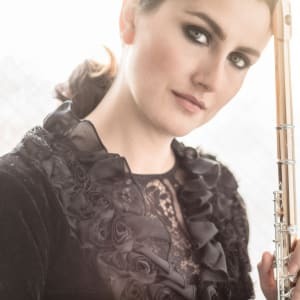 Australian flutist Catherine Gregory has built a diverse and accomplished career as a soloist, orchestral player, chamber musician, and teaching artist. The New York Times has called her playing “magically mysterious,” also writing that “Ms. Gregory left a deep impression… her sound rich and fully present.” Based in New York City, she has performed at Carnegie Hall, The Kennedy Center, Alice Tully Hall, and at the Lincoln Center Festival. A sought-after chamber musician, she has been invited to the Mt. Desert Festival of Chamber Music, Scrag Mountain Music, Chestnut Hill Concert series, Lyrica Chamber Music, and Summit: Music in the Mountains Chamber Series. Her performances have also been heard live on ABC Classic FM (Australia) as well as WFMT Chicago and WQED Pittsburgh. She serves as a co-artististc director of Decoda—Affiliate Ensemble of Carnegie Hall, and Resident Ensemble for Creative Performance at the Guildhall School in London. She has collaborated with such composers as Steve Reich, David Lang, Missy Mazzoli and The Brothers Balliett. This season, she commissions a new work for flute and piano from Pulitzer-finalist Timo Andres. The recipient of numerous awards, Catherine has been a Fulbright Scholar, a Brisbane City Council Emerging Artist’s Fellow, and an American Australian Association’s Dame Joan Sutherland Fund grantee. After receiving her Masters degree with High Distinction, which included studies with Sally Walker, Ms. Gregory earned her Artist Diploma at Carnegie Mellon University (USA) where she studied with Alberto Almarza and Jeanne Baxtresser.